Be sure to check out out newest listing at 7395 Regina Royale in Mara Villa. There is a video of the home you won't want to miss! We grouped together Mira Lago, Marbella and Mara Villas due to the similar location within Palmer Ranch, their similar construction and price range. The communities are small by themselves and as such will have limited availability. All communities are gated and deed-restricted and Mara Villas is located within the Pestancia Subdivision featuring golf course views. All homes are concrete block construction and have maintenance free choices as well. You will also find open Florida designs with garages, many homes feature private pools and barrel tile roofs are standard. In other words, if any of these areas are of interest, it would make sense to investigate the others. Amenities will vary and the maintenance fees vary accordingly. 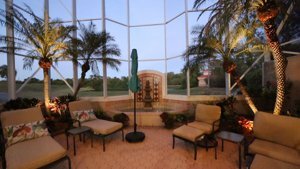 Location wise, you just cannot beat the southern Sarasota location on Palmer Ranch. Shopping at the Westfield Mall is just a few minutes south, the #1 rated Siesta Key Beach is just 10 minutes away and access to the interstate is just a short drive. Mira Lago is a 182 home subdivision featuring maintenance free attached and freestanding villas located on the north side of Palmer Ranch Parkway. The community is gated and offers a community heated pool. Homes are open and airy with soaring ceilings and double car garages. Expect smaller two-bed two-bath units to start with 1,400 square feet and the larger free standing villas will have up to three-bedrooms and three batch with over 3,100 square feet. Construction ran from 1990 and ended in 1997. Lot sizes are from about 4,000 to 8,000 square feet. Marbella has streets names Via Mirada, Paseo Castille and Avenida Marbella. Here, you will find single-family homes ranging from 1,500 to 3,200 square feet. Homes are contemporary Florida split-plan designs that were built between 1989 and 1994. Monthly fees are the lowest of the trio as maintenance for the homes here are on the owners. Lot sizes will range from 5,600 to 14,000 square feet. Mara Villas are condominiums, Mara Villas II are maintenance free villas located within Prestancia. There are 57 units on Regina Royale and Mara Vista Drive. The condominiums offer covered parking and the villas all have garages. Construction took place in 1990. The community offers a heated swimming pool and spa, security, storage room for the condominiums and views of the golf course at Prestancia. Expect the size of these homes to range from 1,300 to 2,700 square feet. Prestancia maintains a website for further information and fees here will include full-time security. The schools here are Gulf Gate Elementary, Sarasota Middle and Riverview High School. Knowing the active market is always key to any successful real estate transaction. Be sue to take a look at similar villas for sale in the area to get a sense of value. The next step is to have access to recent sales. Our sold page has all the recent villa sales in Prestancia along with full detail. Our listings are updated several times an hour direct from the Sarasota MLS. For additional analysis, the market report shows the per square foot costs along with supply and demand flow. The smart buyer or seller will see that staying on top of the market is one of the best ways to gain the confidence in a good deal regardless of buying or selling. We are the local experts when it comes to Prestancia, Marbella, Mira Lago and Mara Villas. We love the Sarasota Real Estate market and welcome the opportunity to work with you and find that special place to call home.